Unemployment creates a certain kind of negative waves in that particular person that he/she starts to isolate themselves from others. This kind isolation entirely affects a human body and mind. The unemployed person starts isolating himself thinking that other people may make fun of him/her or may sympathize them. At the time of their employment, most of the time they will be busy, but when suddenly he/she loses the job it turns them to isolation state. Mental isolation at the time of unemployment cause a very severe effect on our, mental state. People going through mental isolation can have little odd with everyone. They may start hating people or hate to mingle with them. And people suffering from mental isolation, may take some serious step against their life. This kind of state of mind is very dangerous. Being alone during unemployment can turn things worse. And to avoid such negative isolation, it is always better to spend time with family or friends. People should take unemployment in a very positive way. Normally, people handle unemployment in such a way that they start isolating themselves and try to avoid meeting people. After losing a job never feel disheartened because if one job goes, then another one will come, its called circle of life. So to avoid such negativity about losing a job. It’s always better to be positive during unemployment. Instead of isolating yourself, try to meet people, build your career network so that you will come out of that unemployment zone. And start updating your references. 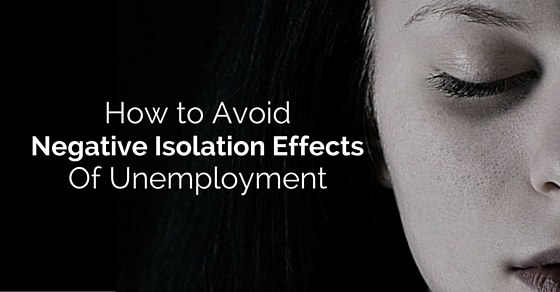 Isolation lets you stuck in one particular zone, which ultimately affects your life. To avoid all that issues, it’s always better to share your problems with others. Never make yourself alone. Try to spend time with your family and friends. Once you start communicating your issues, you keep feeing lighter inside. There won’t be a heavy feeling of being unemployed. After losing a job, generally people start giving you suggestion and even they pity you with consoling voice. Some people start giving you negative judgement about this current employment. That kind of negative judgement always starts with “what if”. So avoid it and be strong. Only our family and friends can only give us positivity. Whenever you feel low, always think of someone who stood by during your tough times. By this you will be a lot stronger. Family is one place where we go to reduce our stress. The family and friends makes us feel better about ourselves. During this kind of stressful time one needs their support. Never turn yourself on family because you never know what and who can help you. The family and friends makes us complete and never lets us feel down about ourselves. Not all unemployed people feel negative, it’s just those people who are emotionally or financially weak tend to lose trust on positivity and gets affected by negative energy. Absorbing positive energy such as talking about positive things in your life, about your future plan and about family or friends. So by doing this, an unemployed person will feel way better. By giving yourself the chance to be creative. Sometimes you must be having some talent which needs a little polish. So try to find yourself and be confident in yourself. If you feel working for someone is not the actual worth of your talent then try to give yourself to be a boss of yourself. Family or spouse of such people needs to take care of them not their problems. Because if you start taking charge on their problems, they start feeling that they are good for nothing and feel dependent on their family or spouse. To make such people independent, one’s family or spouse needs to make sure that they never interfere in their problem which they can handle very well. After going through this kind of mental and physical torture of being unemployed, it’s high time to push yourself and get out of your comfort zone. Take a risk and see how well you can handle that. After handling this unemployment, a person can handle any kind of loss of personal and professional trauma. It’s never late for anything if you believe in yourself. To avoid the negativity of unemployment, one should at least try by themselves to communicate with others. If you keep things in yourself and don’t share it with anyone, then you will start feeling guilty of something which you never did. This kind of thinking may affect your physical and mental level. And avoid watching television at home and try to help yourself. Losing a job will never make you a loser. It’s just people start thinking that without a job one can never achieve or follow his / her dreams. There are many people who are very secured but still not happy with what they are doing. Because they sacrifice their dreams for the sake of money and luxury. So after losing a job instead of grieving about it, give yourself a shot to follow your dream. By communicating with another, one can build their confidence. To come out of that unemployment zone one should at least try to start conversing with others. To do that one has to have their confidence back and one need to be self sufficient. Never care about what people think about you. Build your confidence and fight out your problem. Sometimes we get so carried away with our emotions that we lose our thinking ability. We start doing things spontaneously, and that will have a negative effect on us. During this time we feel emotionally weak, so to avoid such emotional breakdown, one need to be clear and move on. Stop listening to your emotions and be practical enough to handle your own problem. Being patient and waiting for something to turn up, can give you a hope to start feeling better about yourself. Sometimes when we wait and hold our process, something big and great will come up. Patience can make your life better and even lets you to be in your control. Even after losing a job, if you hold on to patience then one day things will turn in your favor. Whatever plan you made for your future or career start turning them into action. Don’t delay anything. Always think of completing a task in that time itself. It may give you a sense of satisfaction. Starting your own career will turn you into a better man / women. So better hurry to give your life a new pair of glasses to see the world differently. When you suddenly lose a job, you always think first that how you will handle the financial loss. So to secure your future always have a savings. Even by saving a small amount you can make fortunes out of it. So keep a habit of saving a bit to reduce financial pressure on sudden event. This may help you avoid negative isolation effects. When some things start going out of hands and you start behaving really badly, that time one can seek professional help. Professional help can be given by counseling. Through these counseling session a person going through negative isolation will at least get to know their problem. Counseling will help you heal in yourself better. Never feel awkward to seek some help from such counselors. Never let anyone manipulate you or criticize you. Be your own boss and let them lead you life. Stop feeling pity about yourself. Keep all these in mind start your life, then it will be like clicking a refresh button. You may start feeling better about yourself and even think of giving a shot to life. Always lead your life in your way and even handle your problems in your way. Anger can ruin many things during unemployment. It also can create a barrier between you and your loved ones. Anger is always a bad reaction for kind of situation. Instead of being angry if one stays calm and solves a problem then one can surely get a permanent solution. It also helps you get over with negative isolation effects. Get a hold on your anger and move on calm. When you trust your decisions, you start trusting yourself. This will help you overcome your decision making fear. When start trusting your decision, you start taking risks . This will help you ignore all the negativity around you. Never doubt your decision, and the question which starts with what if’s. Be positive and trust your instincts. Always approach life with positive elements. Be strong to face any kind of situations. Even during the time when you isolate yourself because of unemployment. Always think that this is just there for a small period of time. Every problem has its solution and if there is no solutions available for it then, it will end soon without solutions. Be a person who fights such problems, not one who runs from it. When you start comparing your life with others, you will always find flaws in your life. This makes you feel more isolated and you start meeting such people who you compare with yourselves. In this case you will lead on yourself towards negative isolation effects and at the end surrender yourself to it. Never make such mistake of comparing yourself with others because everyone has their own way of leading their life. To end this discussion, I would like to suggest that every human being deserves a goal to lead his / her life. Sometime situation makes us think very negatively about ourselves and to overcome such situation you need to have a strong will to move on with it. We face certain situation when we feel we are stuck in it, but instead of getting scared of such situations, always think that this will end soon. Therefore, try to follow all above mentioned ways to avoid such negative isolation effects of unemployment. At the end, always have faith in yourself and give yourself a reason to move on. If you fail in trusting yourself then you may start doubting your decisions.